Slice steak into thick strips and fold over. Thread onto metal skewers with the mushrooms, courgette and red onion and place in a shallow baking dish. Mix together soy sauce, honey and chilli powder and pour this on top and allow to marinate for at least 20 minutes. Preheat the barbecue and cook the beef skewers for 3-4 minutes on either side. 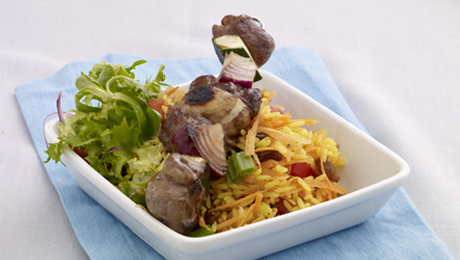 Serve the skewers hot off the barbecue with curried rice salad. Half fill a large saucepan with water, whisk in the curry powder and add the rice. Bring to the boil and cook according to the packet instructions, stirring constantly. When cooked, drain off the water and cool under running water until the rice is completely cold. Put into a large mixing bowl and add the diced tomatoes, grated carrot & sultanas and mix well. Season lightly with a little salt and pepper.